For most colored objects, it’s all about having a pigment which absorbs some wavelengths and reflects others. But for butterflies and birds among others, the situation is quite different. They do have pigmented color, but they also display what is called structural color. Structural coloration is produced by microscopically structured surfaces, fine enough to interfere with visible light, creating interference patterns which augment some colors and suppress others. Now, a team of researchers has shown just how incredibly fast those patterns can evolve, shifting them from brown to purple in just six generations. 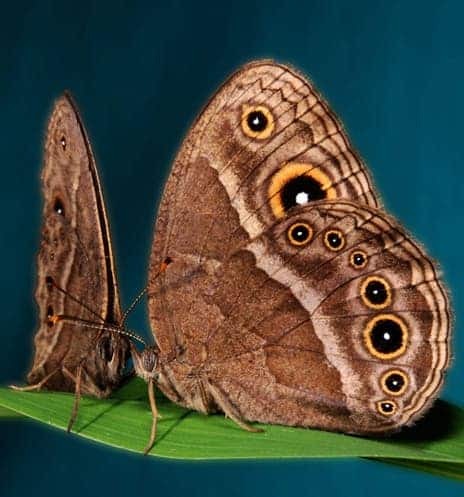 The species chosen for this work was Bicyclus anynana (also known as the squinting brown bush), a small brown butterfly in a very diverse family of butterflies, primarily found in eastern Africa. The majority of its pigmentation is brown, except for the “eye features” it has on its wings. Scientists chose this species for several reasons, but most notably because squinting brown bush is a more complex coloration than it might seem, in that the butterfly also readily reflects ultraviolet light. Furthermore, even though the species is brown, two other members of the genus have developed purple coloration in the past, suggesting that this was in the realm of possibility. The researchers started by checking the absorption spectrum of their existing lab strain of butterflies. This showed a peak of reflection at 300nm wavelengths, well within the UV range of the spectrum. But the peak varied from individual to individual and was rather broad, so they chose the males and females which had the peak closer to the visible spectrum, and had them mate together. They repeated the process for 5 more generations, and voila – they ended up with a visible violet pattern! Six generations of this species means less than a year. However, it has to be said that the experiment actually involved 8 generations, but two of them produced low numbers of offspring and were simply allowed to mate randomly to build up their numbers. 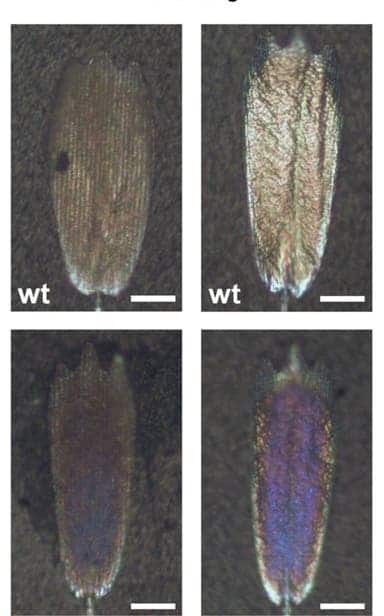 The study shows that even a complex mechanism such as structural coloring can evolve incredibly fast and undergo radical rearrangements to its optical properties. If there was a natural environment, the process would have taken longer, but it could have still been incredibly fast. This natural adaptability and potential to change means that butterflies don’t have to wait for a lucky mutation to make things happen.